So I’m sitting at my desk and slip into that dreaded slumped and rounded shoulder position. I eventually spot what I’m doing and quickly readjust my posture back to a more upright and shoulder back position, I smile and quietly congratulate myself for fixing and spotting it so early. An hour later I’m still sitting at the desk, haven’t taken the break after 15 minutes like I promised and I’m back into that crappy position. How often have you found this happening to you? Despite our best intentions and well-meaning plans we often slip into this awful posture and find ourselves trying to stretch out this tightness. Hours, weeks and even years of sitting at our desks can cause the muscles in our upper back to weaken and this can lead to a whole series of problems. These “T’s” are one of my favourite ways to undo some of the posture issues with weak back muscles. 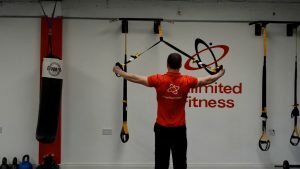 A few sets of 10 reps will awaken them rhomboids and help you get back to that confident looking shoulder back posture!! !